I'm excited to be sporting a few (stay tuned) Wrangler 70th Anniversary Collection pieces, but today I'm wearing arguably the best denim jacket I've ever owned! It's called The Wrangler's 70th Anniversary Cropped Jacket and not only is it a perfect fit (XS for measure) but as the name implies, it's cropped. It hits me at the top of the hip bone, as opposed to inches past there like most denim jackets. I bring this up because a lot of us vintage loving babes prefer cropped top layers to accommodate higher waisted bottoms. This is the perfect jacket to carry around with you when it's too hot to wear outside during the day, but the AC blasting indoors or the evening may be too cold so you'll need a layer. To round out the outfit (as I couldn't just wear a jacket ONLY for y'all 😱) I'm wearing my newest favorite dress from summer! Retrolicious has never strayed from dinosaur prints in the past, but they've recently released a hot pink dress with dinosaurs all over it! (Called the Dinomite dress!) I snagged this from Lovely In Lilac a few weeks back and trust me, I'm giving this dress a very happy home! 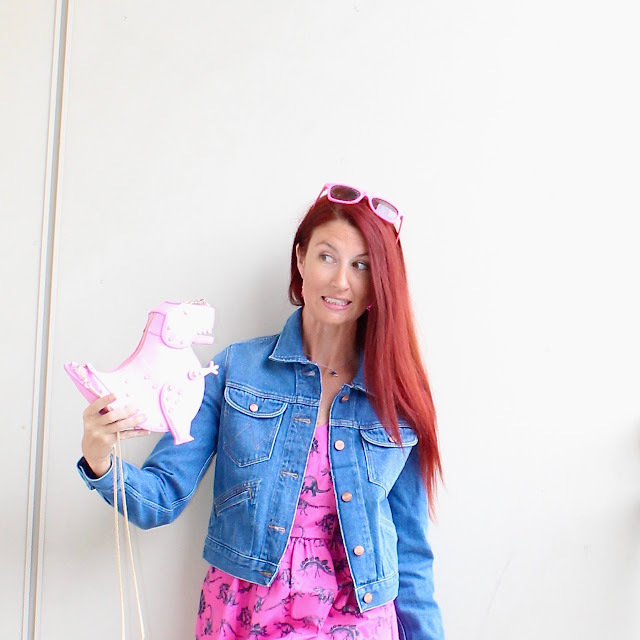 I had to add further whimsy with my pink T-Rex bag (and matching earrings) from Kate Spade (duh) but I kept the rest of the outfit simple. Summer is a time for no muss and no fuss, so I wanted to wear my hot pink flip flops from Old Navy. I know I wear heels a lot, but I used to live in Florida where you can wear flip flops to fancy events and I could never quite quit that habit! This whole look is a great example of keeping things low maintenance, yet classic and still bold. The blue denim and pink play perfectly off each other, the dinosaurs and pink keep it fun and bold, and the jacket and flip flops keep it casual! I hope everyone is having a great week! In my world I'm excited about two things: one, today will be day 55(!) of doing yoga every damn day! Last week I put out my post on doing one month of yoga, but it was belated as my schedule threw some wrenches in the works for my all around blogging schedule. So in just over a week you can expect a post about month two, as I'm going to try to post them monthly and a lot closer to when I complete a month! Also, this is going to make me sound hella nerdy, but I've become borderline obsessed with the show Adam Ruins Everything! The new season premiered last night (already watched the first episode and loved it)! I've been very much looking forward to new season, so yay! Haven't heard of it, don't know much about it, or know it/love it and wanna geek out with me? For any of the above, click this Blair Uncensored link to read my gushing review on the series! Have a great midweek, Internet! Great look, Lauren!! 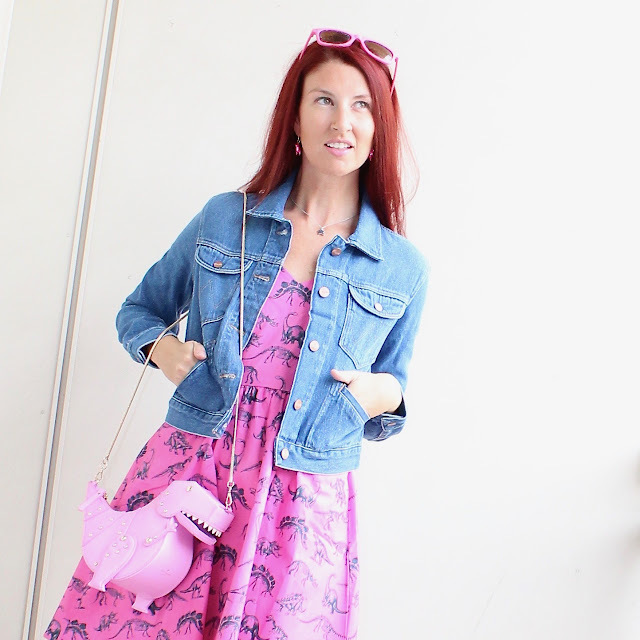 I keep thinking I need a denim jacket like this---they are so versatile! !